It used to be that the big eat the small; now it’s the fast that eat the slow. Fast is the new big. In business software more than any other sector, this is the new reality. It is no longer big vs. small, but rather fast vs. slow. Which is why we went ahead and made one of the slowest and stressful processes a lot faster. 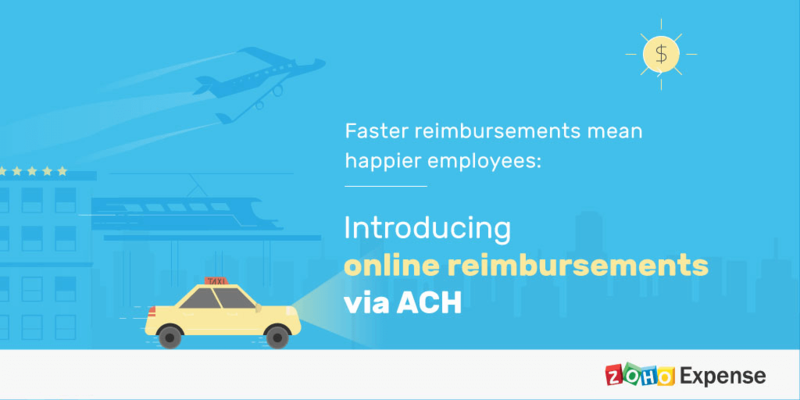 Introducing online reimbursements via ACH in Zoho Expense, powered by Forte. This service is now available in the US only. Reimbursements for expense reports usually takes weeks on paper or with any offline procedure. By moving to our online method, you not only streamline the process but speed it up significantly as well. By how much? Ideally, you can now complete a reimbursement in 3-5 business days. Since our goal was to quicken up the whole reimbursement process, we made doubly sure that the setup procedure wouldn’t take much effort from your side. That’s why we made it a simple three-step procedure: set up merchant and withdrawal accounts, add the deposit account, and then reimburse. Setting up the merchant and withdrawal bank accounts is a one-time procedure. All you have to do is enter a few business details like your Tax ID Number, Routing Number, Address, etc. and add the bank account from which reimbursements for expense reports are processed. Forte will act as the bridge between your withdrawal account and the deposit account. You can add each employee’s deposit account in just a couple of clicks. Once everything is set up and verified, the final step is to go ahead and reimburse via ACH. We minimized when it came to setup steps, but when it comes to benefits, we’re maximizing. We have packed in a lot of benefits with this feature: easy approvals, fast turnaround, self-service tracking, and notification when a payment fails. Once you have set up your withdrawal and deposit accounts in Zoho Expense, you can reimburse your employees with just a click. Forte makes sure that the payment is reflected in the employees’ accounts in 3-5 business days. Your employees can track the status of their reimbursements from start to end. If for any reason a reimbursement is canceled, you and the employee will be notified about it, so that you can take the appropriate action to rectify it. The biggest benefit of all is the genuine appreciation you’ll receive from your employees for making a tedious procedure an absolute breeze. And if any issues come up that makes the process less than breezy, you can always turn to our spectacular support team. Excited? Because we certainly are! Give the feature a spin and tell us what you think.